August 12 marks the Karen Martyrs’ Day and its people scattered around the world take time to honor and remember those who died for freedom. Every year Karen leaders, soldiers and civilians commemorate the sacrifice of those who gave their lives for the cause of the Karen people under successive Burma military regimes. 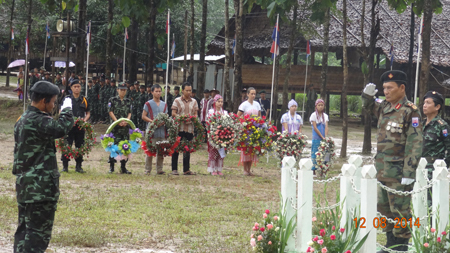 Karen civilians and leaders from Karen National Union’s Hpa-an district gathered to commemorate Karen Martyrs’ Day at the headquarters of the Karen National Liberated Army (KNLA)’s 7th Brigade. Among those attending was KNLA Chief-of-Staff General Saw Johnny. The ceremony started with military parade followed by speeches and songs to honor the martyrs. Speaking to Karen News, General Saw Johnny said that the struggle had yet to come to an end. During the ceremony, General Saw Johnny, inspected the troops and respected and honored the civilians, military commanders, private units and members of the KNU who had sacrificed their lives for the Karen resistance movement. A military parade was followed by the placing of wreaths on the martyrs’ pillar, and the reading of speeches prepared by the KNU’s Chairman, Saw Mutu Sae Poe. KNLA Chief-of-Staff, General Saw Johnny, and Hpa-an district chairperson, Padoh Saw Aung Maung Aye, also spoke at the commemoration. The Karen Women Organization (KWO) and the Karen Youth Organization (KYO) delivered their formal massages for martyrs’ day. The closing ceremony ended when the crowd saluted the Karen national flag. KNU Chairperson, General Saw Mutu Sae Poe, paid thanks in his speech to the sacrifice of the loyal Karen leaders, comrades and civilians who paid with their lives in the fight for independence, for freedom and human rights, for self-determination and for the survival with dignity of the Karen nation. General Saw Mutu paid tribute to the fallen for keeping the Karen struggle alive. Marty’s Day was also hosted at Thay Bay Hta, the KNLA’s headquarters. The ceremony was attended by civilians, the KNU, leaders from military headquarters and representatives from Karen civil organizations. The Karen’s charismatic leader, Saw Ba U Gyi was murdered on August 12, 1950, a day now marked to commemorate his death and all those soldiers and Karen people who died in the armed conflict.